Gtbank Salary Advance Loan will help you get between N12,500 - N500,000 and while you pay instalmentally depending on the amount you request and how much you earn monthly as a salary. With GTBank Internet Banking, you can request for Salary Advance Online without physically coming to the Bank. 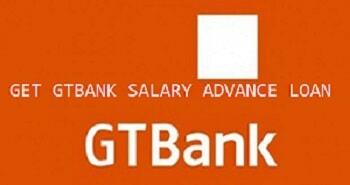 You are required to have your salary account domiciled with GTBank before initiating a Salary Advance Request. Below is your Salary advance request history. * You must have your salary account domiciled with GTBank. * You must have received your salary through your account in the last three months from the same employer. * Your salary is paid in Naira (NGN). * Minimum net monthly salary for public sector employees is =N= 25,000. * Minimum net monthly salary for private sector employees is =N=50,000. * You can only apply for a maximum of 50% of net monthly salary. * Minimum loan amount on Salary Advance is N12,500 and the Maximum loan amount on Salary Advance is N500,000. * Monthly salary is N 50,000 and above for private sector employees. * This application is subject to the Bank's approval. The Bank shall be entitled at its sole discretion to decline an application without furnishing any reason. * Your application will be treated between 8am and 5pm on working days. * You can only view the history of your request on this platform. Keep reading below you might see all the answers to any question you might have. How much is the interest rate for Gtbank Salary Advance Loan? Am sure the question on you head might be the interest rate involved on the Loan but don't worry i have the answer to that question. it simply means that you are going to pay 30% interest rate. and when you borrow like N500,000 you will need to pay. What are the repayment validity for Gtbank Salary Advance Loan? The most important question again you need to ask yourself before requesting for a loan is how long it will take you to pay back and Gtbank only gives you between 30days to 6months. From the article, it seems the least amount given for the loan is N12,500. You can contact any GTBank official for other inside details concerning the loan. Goodluck! i need loan of 100,000 for accommodation and what is the interest rate? What are general requirements to get a loan? Do I need to receive my salary through bank account and what is the maximum amount of the loan? Also, I am interested what is the interest rate for such loan?